This blog is about the most famous Ethiopian cuisine – the ‘injera’. Nailing down a recipe for injera has been surprisingly tough, whenever I have asked people about exact quantities or timings, the response has been frustratingly vague, “you just know” or “you have to feel it in your heart”. Ingredients change depending on where you are in the country, and, don’t even bother asking a man about how to cook injera, this is 100% a woman’s job. 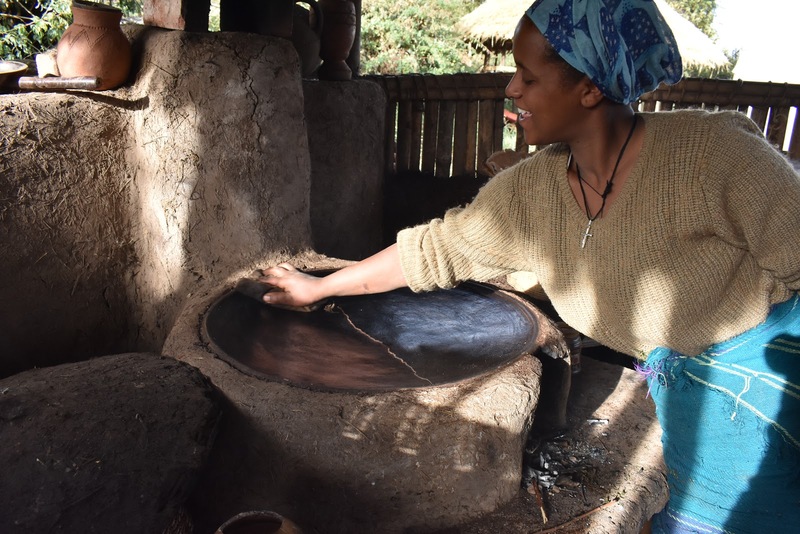 This recipe and process for making injera comes from the dream team that are Kalima and Sili, the resident cooks at Mulu Ecolodge. Injera is a large pancake that’s eaten absolutely all over Ethiopia, for breakfast, lunch and supper. Locals love it so much they even have a dish called ‘injera firfir’ which is essentially injera wrapped in injera. Most commonly, the injera is laid out on a large plate, various wats are dolloped on top, and the whole dish is eaten using just your right hand. Many people eat from the same injera plate, so the polite thing to do is to try and get the contents of what’s in your hand, into your mouth without getting your fingers dirty. Easier said than done. Tef flour is the main ingredient, which is dubbed a ‘superfood’ in most health food shops, it’s gluten-free and packed full of vitamins, iron and calcium. The major snag is that it’s a ball-ache to produce, only growing on flat areas in altitudes between 1,500 and 2,400 metres above sea level. The grass is also so small and delicate that it must be sown in shallow soil, requires a lot of water and the whole field must be weeded and then harvested by hand. Even the name hints at its trickiness, tef comes from the Amharic word ‘tefa’ which means ‘lost’, because once you drop it it’s difficult to find again. 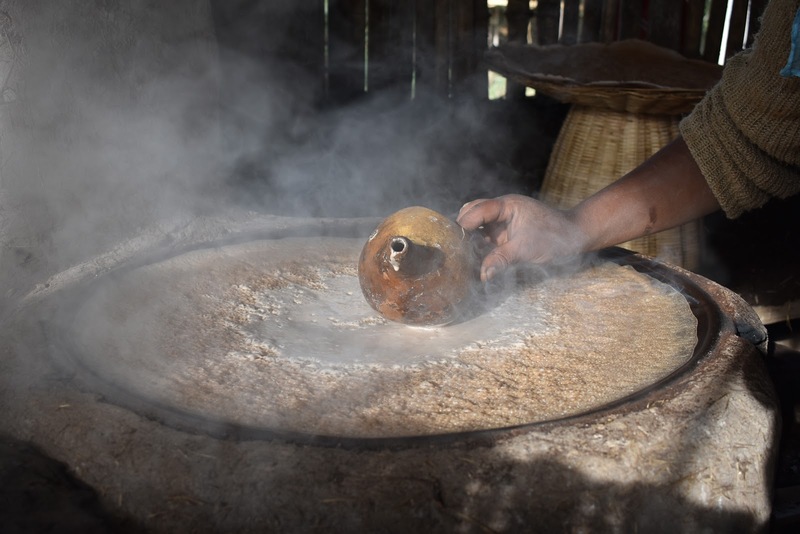 Due to all this, tef flour forms only part of the injera mix, the rest is made up using whatever else is grown locally and easily obtainable – e.g. sorghum, wheat, barley, rice etc. Rumour has it that a whole load of injeras were made using gypsum (a type of cement). 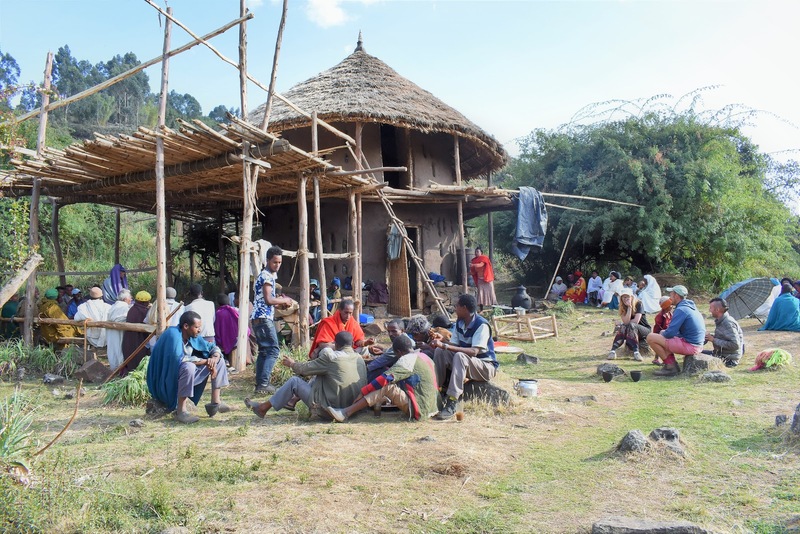 Ethiopia’s equivalent to the horsemeat scandal…. Because we are in an area that doesn’t grow tef, Sili and Kalima’s recipe is a mixture of 3 parts tef flour, to 1 part wheat flour and 1 part maize flour. Sili explains, “tef for the flavour, wheat for the flexibility and maize for the bubbles”. 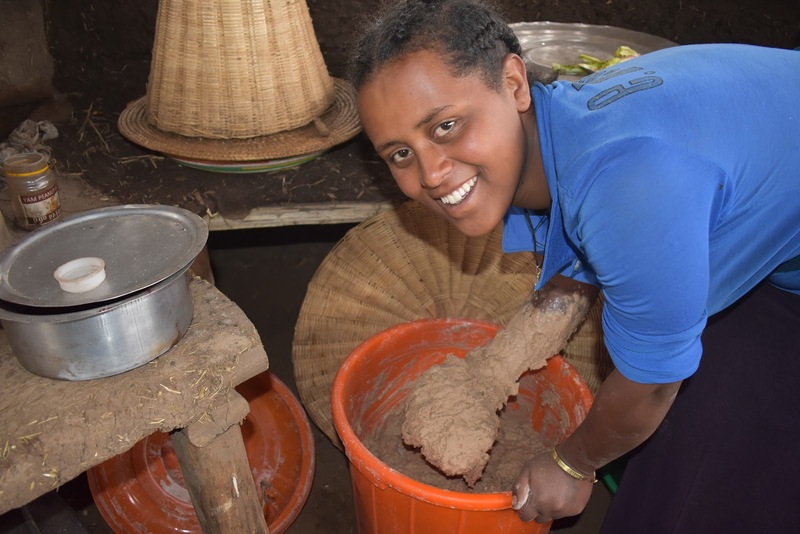 Their flour is pre-mixed and kept in a massive clay pot to the side of the injera stove. The only other things that are added to the mix is water and a little of the fermented starter left over from the previous batch. Again, the process varies depending on the climate and altitude of where you are, it can take as little as 2 days or as long as 5 days for the mixture to prove. 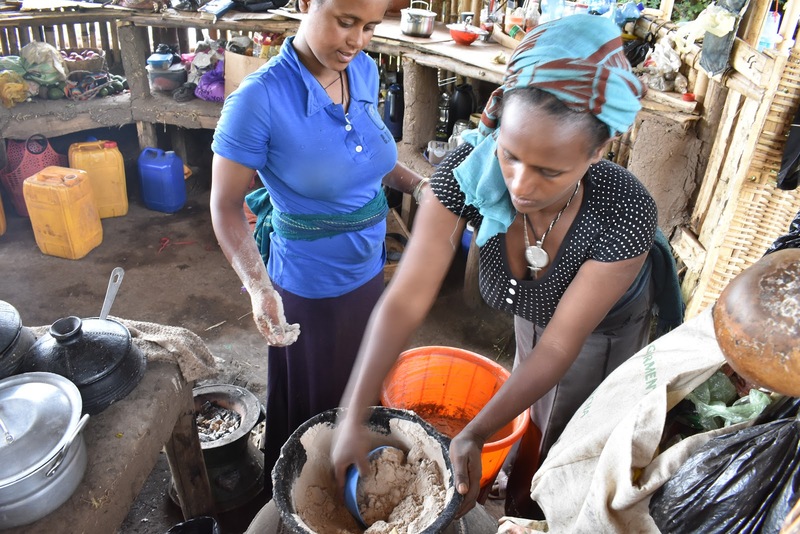 At Mulu, their injera mix takes 3 days and because injera eating is an everyday occurrence, Sili and Kalima are constantly in the process of preparing injera. On day 1, handfuls of flour and a little water are added to a cupful of remaining injera starter from the previous mixture. In a large tub, Kalima combines the mixture with her hands until it all clumps together and is just thicker than bread dough. The mixture is then lidded and left. By day 2 the mixture has risen considerably. Sili explains that if you are making this mix from scratch (i.e. no starter from the previous batch to use) the proving process will take a bit longer and will probably rise a lot the first time. Usually though, the mix should not be more than double its original size. By day 3 the injera mixture at Mulu is ready. Sili and Kalima know this because the mixture smells sour, has started to crack on the surface and is producing bubbles. It will also have shrunk back down a bit (if you use a clear container to prove the mix you will be able to see the tide marks on the side). 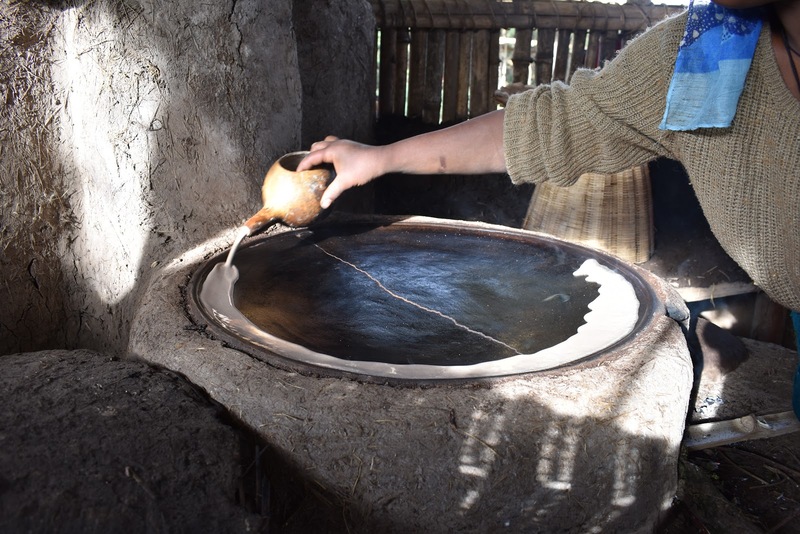 This fermentation process is very important, it gives the injera it’s trademark taste but also means the injera won’t stick to the pan when cooking. Once fermentation has taken place, water is boiled, left to cool until hot, then added to the mixture. Now resembling thin pancake batter, it is stirred and then left to rise again overnight. By the morning it is ready for cooking. It is completely normal for some of the water that has been added to separate from the rest of the mixture. If this is the case Kalima removes some of the water using a jug and then stirs the mixture. If the mixture is too thick, the removed water is added back in. If it’s the right consistency, then the water is kept back for use in the next batch. 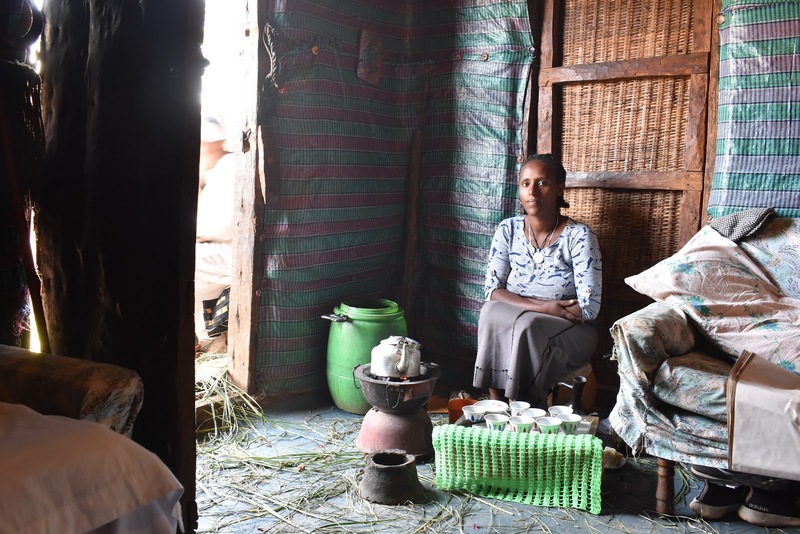 Every house in Ethiopia has an injera stove. 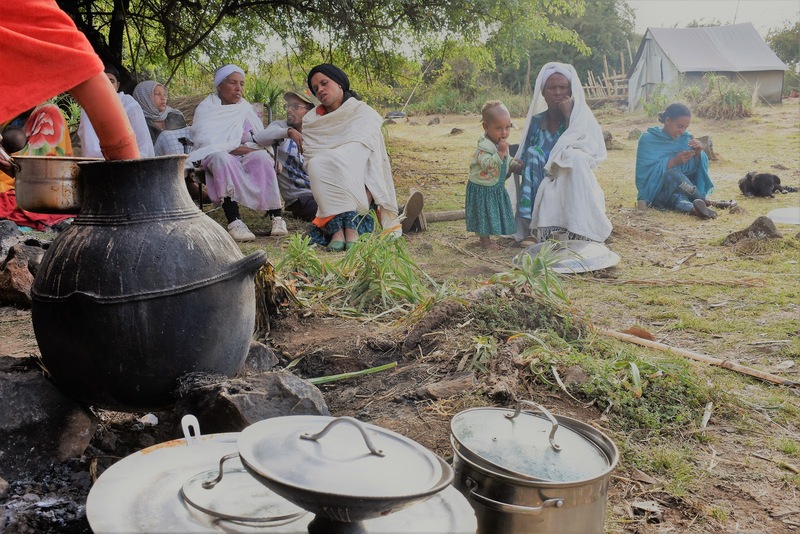 Building the stove is one of the first tasks of a newly married woman. 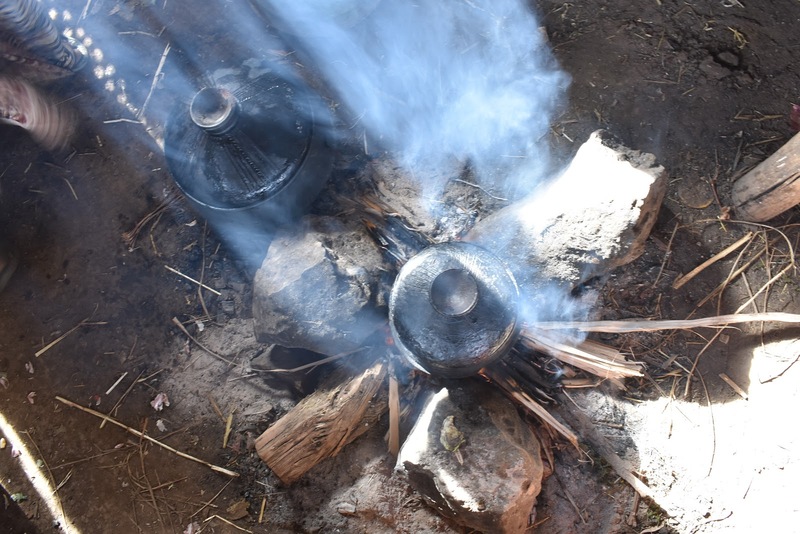 The stove at Mulu has been made from clay, bricks and mud and is heated with firewood underneath. The cooking plate has a characteristic crack down the middle where Valerie’s (Valerie is the woman who runs Mulu Lodge) father heated the stove too high when using the oven for pizza, so now all the injeras turn out with a black line down the bottom of them. I like this quirk. Once the stove is the right heat cabbage seeds are wiped over the injera plate using a piece of cloth. The natural oils in the cabbage seeds prevents the injera mixture from sticking to the plate whilst cooking. Kalima then slowly pours the injera mixture onto the plate, going clockwise and gradually working her way into the centre. She leaves a little gap in the middle and using the bottom of her pouring cup (in this case, a hollowed-out gourd) connects the mix together. If you continued to pour right into the middle of the plate, then the resulting injera would be too thick. Immediately after, the lid is placed on the injera and is left to cook for a couple of minutes. The lid is heavy enough to keep the heat in, but not sealed, so that steam can still escape. This is important so that condensation doesn’t build up and drip on the cooking injera. Kalima knows it’s cooked once the sides of the injera start to turn up and bubbles appear. She carefully lifts the injera from the plate and places it onto a wicker basket where it can fully cool with air passing above and below. This is another important thing to remember, otherwise the injera will get the dreaded ‘soggy bottom’. Once fully cooled the injera is added to the stack of other cooked injera. Unarguably the best part of the process. Injera is at its best when fresh, the edges and underneath are nice and crispy and the centre warm and spongy. 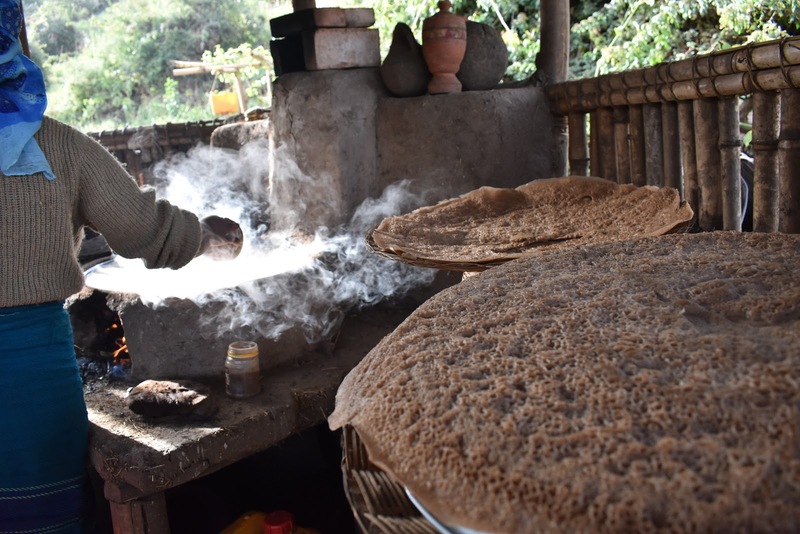 If you are up early enough at Mulu on injera making day then you can sit in the kitchen and eat fresh injera dipped into berbere spices – it’s heaven. Unsurprisingly I’m not the only person who knows this and the kitchen is always humming with farmers, volunteers and other workers who are hoping their early start will be rewarded with fresh injera. Most of the recipes on this blog are traditionally eaten with injera, especially shiro, tibs and doro wat. 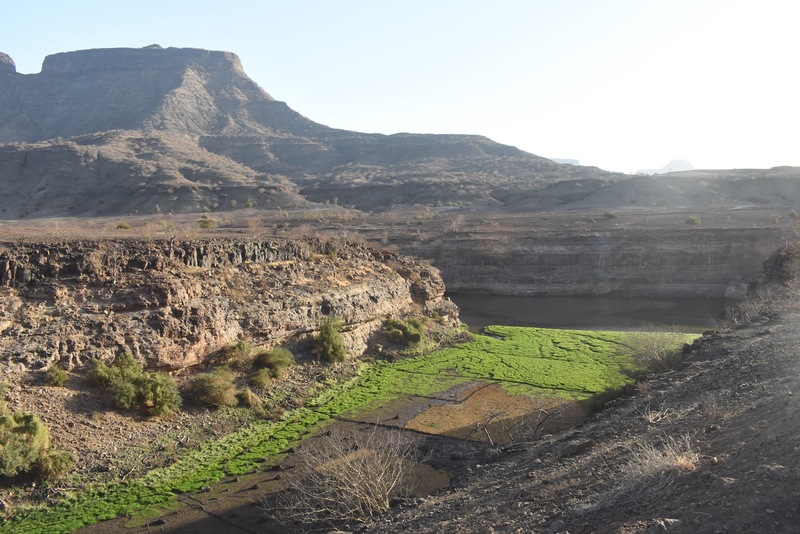 During the fasting period and on fasting days (Wednesday and Friday) you can eat ‘beyeynet’, which is injera with a selection of vegan dishes dolloped on top. If you would like to find out more about Mulu Ecolodge then check out their website: www.mululodge.com. It’s possible to volunteer here and get involved with the project, or come autumn you can come and stay as a guest. BUT, some non-Ethiopian substitutes are worth highlighting: use a non-stick frying pan instead of the injera stove, don’t add oil instead of cabbage seeds as this doesn’t work with the injera mix. Cover the pan with a plate when cooking and then place the injera on a cooling rack, as opposed to wicker basket.